An important concept that plays a big role in modern conceptions of the universe is that of “vacua”, a Latin word meaning the plural of “vacuum”. Now I hope you’re not thinking of “vacuum” as a verb meaning “to remove dust using an appropriate machine”; if so, switch that idea off, and let the dust settle. But even if you think of “vacuum” as a noun, the way a physicist does — as empty space with nothing in it, certainly no air, and not even stray elementary particles — then there’s something odd about the notion that “vacuum” could have a plural. Clearly, there’s something additional that has been added on to the notion! That’s what I intend now to explain. First, let me remind you what a theory is, in physics. It’s not a speculation, or an idea; it’s something much more concrete. A theory is a set of equations, and accompanying concepts, that allows scientists to make predictions for how physical objects will behave. Some theories are meant to describe the real world; most of them describe imaginary worlds; but any reasonable theory makes consistent predictions, and describes aspects of a possible world. For example, Newton’s theory of gravity is one in which the force of gravity between two objects that are a distance r apart is proportional to 1/r²; this (approximately) describes what happens in the real world. A different theory of gravity might be one in which the force is proportional to 1/r³; this is still a physics theory because it does indeed make clear predictions for how objects will pull on each other via gravity, but it describes an imaginary world, not the real world we live in. It’s a perfectly good physics theory, but it doesn’t describe nature… our world’s nature. Now, some theories (not all of them, by any means) are intended to describe not only things but the absence of things, in the form of empty space — also known as “the vacuum”. In Newton’s day, empty space was simple — it was just that: empty space. But over the years, empty space has gotten more and more complicated. One thing that was learned in the 1800s is that empty space actually has fields in it — and today we think of fields as the most elementary aspects of the universe, so they’re pretty important! Fields are things that can take a value at any point in space and at any moment in time. In the daily world around us, the temperature of the air is a field — at any time and in any location, you can measure the temperature, and if you knew the temperature everywhere in space, you’d know the temperature field at that time. But this isn’t a proper example for us here, because the temperature of the air is only meaningful where there is air, and there’s no meaning to a temperature field in empty space. So when we talk about empty space, we really mean space that is as empty as possible. In some sense it is empty, because it has no particles in it, not even particles of light (photons). (Particles are long-lived and simply-behaved ripples in fields.) But in some sense it is not empty, because the electric field, W field, Higgs field etc. are always in it! The vacuum, or rather, “a” vacuum, isn’t specified just by saying “it’s empty space”, because not only do we have to say that there are no particles in it, we also have to specify what the fields in that empty space are actually doing… Terminology: we say that we have to specify “the configuration of the fields” in that vacuum. In a specific vacuum, the fields may be configured in such a way that most of the fields have an average value equal to zero. (I say “on average” because quantum “fluctuations”, or quantum jitter, assures they’re always fluttering a bit; but this is a side issue for us today.) But some of them may not be zero on average. Such is the case in our own vacuum; all fields are zero on average except for the Higgs field, whose average value is non-zero and is constant across the visible part of the universe (apart from its quantum jitter.) This is very important! The world we know would not be at all recognizable if instead the average value of the Higgs field were zero; indeed, we would not exist at all. It is possible for a universe to have more than one vacuum. That is, it is possible for there to be more than one way for space to be as empty as possible — more than one way to configure the fields of the universe even when all particles are absent. Similarly, a theory which describes a universe may predict that it has more than one vacuum. An example of such a theory is the Standard Model, the equations used to describe and predict the behavior of the known elementary particles and forces of nature (but not including more mysterious elements: gravity, dark matter and dark energy). We now know, having measured the Higgs particle’s mass, that the Standard Model predicts there are two different vacua — one in which the Higgs field has the value that we observe in nature, and one in which it has a much larger value. In short, the theory predicts the possible existence of two very different ways that empty space can behave. Fig. 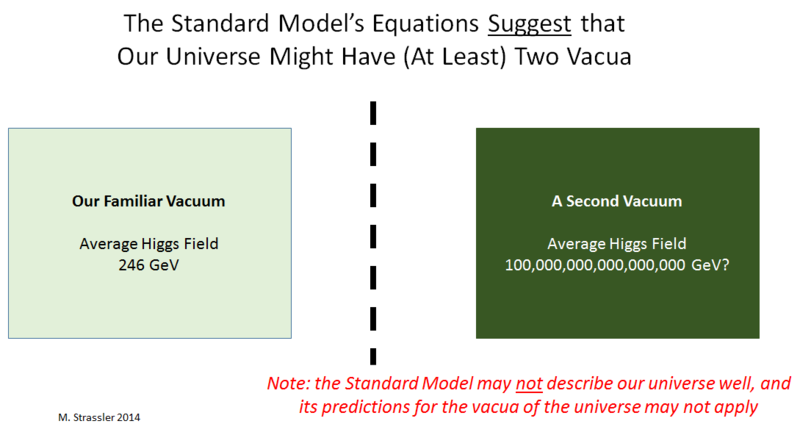 1: The Standard Model predicts that our universe has two possible vacua, in both of which the Higgs field has a non-zero and constant average value. The vacuum shown at left is ours; the one at right, with a much larger value for the Higgs field, would be dramatically different (and disastrous for us.) But caution is advised, because the Standard Model may not accurately describe our universe when the Higgs field has such a large value. But let’s be very, very clear. The theory called the Standard Model predicts that this is the case, for the imaginary universe that the Standard Model describes. We do not yet know, experimentally, whether the Standard Model describes the real universe… i.e. whether the imaginary universe of the Standard Model and the real universe we live in are sufficiently similar that predictions of the Standard Model (theory) match all results from all experiments (data). And therefore, we do not know if the real world has the two vacua that the Standard Model predicts. I’ll discuss these vacua in much more detail in a later article. Fig. 2: The bottom of a bowl is a stable location for a marble; if the marble is moved slightly away from this location, or if the bowl is jiggled slightly, the marble will not roll far away, but instead will rock back and forth in the near vicinity of the bottom. The bottom of a bowl is a “stable location” for a marble. That’s because if you move the marble a small distance in any direction, it rolls back to where it started, rattling around for a short while before friction causes it to stop back at the bottom of the bowl. Equivalently, if you move the marble a small distance away from the bottom, its energy (from its interaction with the Earth’s gravity) inevitably increases, and it will tend to try to reduce that energy by returning to its starting point, where its energy from gravity was as small as possible. A stable location is one in which any shift in the location of the marble increases the energy (or at least does not decrease it.) Conversely, if you could move the marble in such a way as to decrease its energy, the marble would start rolling in that direction and wouldn’t necessarily come back… so that would make its starting point an unstable location. By definition, “a vacuum” is a “stable configuration of the fields of the universe (and of space itself).” In a vacuum, if anyone were to change the values of the fields by a small amount, the values of the fields would tend to return to where they started, bouncing around for a while until they eventually settled down to what they were originally. Equivalently, a vacuum is a configuration of fields for which the energy of the universe is minimized; any small change in the fields leads to an increase (or at least no decrease) in the universe’s energy, and the fields always will tend to return to their values in the vacuum. Similarly, a universe can have — or a theory of a universe can predict the existence of — more than one stable configuration of its fields, i.e., more than one vacuum. There is no limit to the number of possible vacua, though simple theories tend to have very few. Only theories with many types of fields commonly turn out to have many vacua. The question is therefore, at least indirectly, tied to the issue of how many types of fields does our universe really have? Just the ones we know? Or thousands more? Does Our Universe Have Multiple Vacua? they can do a rather detailed calculation. And they find something similar to what is shown in Figure 4. [Note Figure 4 is merely a qualitative sketch! the true picture cannot be drawn to scale.] Just like the double bowl in the middle of Figure 3, which has two stable locations where any motion of the ball increases the energy of the ball, the energy of the Higgs field is predicted by the Standard Model to have two minima. 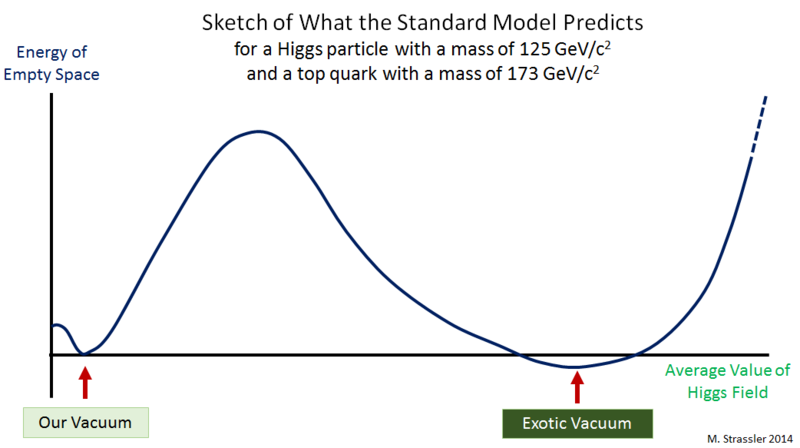 That means that there are two vacua, as indicated by the arrows in Figure 4, with the properties indicated in Figure 1: one vacuum is the one we know, with a rather small value for the Higgs field, while the other, “exotic” vacuum has a huge value. The precise location and depth (i.e., the value of the Higgs field, and the energy of empty space) for the exotic vacuum is in question. They depend quite sensitively on the masses of the top quark and of the Higgs particle, our knowledge of which is still subject to small but crucial changes as more is learned from data at the Large Hadron Collider (where the Higgs was discovered.) Figure 4 shows the current best guess, where our vacuum has somewhat higher energy than the exotic one. The importance of this fact will be addressed in another article. Fig. 4: A very qualitative sketch of what the Standard Model’s equations predict for the energy of empty space as a function of the Higgs field’s average value. 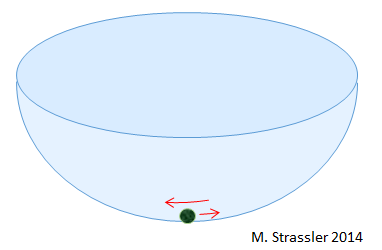 Just as for a marble placed in the bowl in the middle of Figure 3, there are apparently two stable values for the Higgs field, as indicated in Figure 1. The vacuum at left is the one we know. The details of the second, “exotic” vacuum are still quite uncertain. But again, it must be kept firmly in mind that the Standard Model may not describe our universe well enough for any of this conclusion to hold. We already know the Standard Model leaves out gravity, dark matter and dark energy; it may leave out a whole host of as-yet-unknown particles. There may even be more types of Higgs particles, for all we know. Consequently, we don’t know anything for sure yet. Our universe may actually have just one vacuum, or it may have three, a hundred, or many more. Learning about the vacua of the universe remains a wide-open area of current research, one which quite possibly could continue for centuries. How can we understand that a zero value for a Field does not mean that there is no such field ? The electric field in the room in which you are sitting is zero on average. But you can see. Why? Because the electric field, even though zero on average, has waves in it, known as light (or more generally, electromagnetic radiation). Sometimes the field points right, sometimes left, sometimes up, sometimes down; but take the average, you’ll get zero. Even without light, the electric field is jiggling (quantum fluctuations, mentioned in the article.) Those fluctuations have experimental effects. For instance, such effects allowed scientists to predict the mass of the top quark before it was discovered. For a more sophisticated understanding , what would happen if the Electron field is not zero ? Then am I right if I say that any field has always waving values ….i mean take -4 , 4 these are real values despite that their average is zero ,…… Is it like that ? This leads to another point , if for ex. The electron field is the average of -x and x , then what happen if it still zero average but of -10x and 10 x ? Don’t think about electron fields (the electron field is a fermionic field, and these can’t have large average values.) But for the electrIC field, which is a bosonic field, sure. When a photon of light goes by, the electric field has the form of a sine wave, going up and down between x and -x. If you shine a laser, so that N photons go by, then the electric field will go up and down between Nx and -Nx. Also , if the Higgs 246 is the average of say 245 and 247 for example , what would happen is the 246 value is the average of much much bigger values ? Excuse me Doctor strassler but I really want to grasp this wonderful aspects of reality . Yes. More generally: a sine wave has an average value of zero. So does a random distribution, with a Gaussian shape, centered around zero. Why no fermionic field can have a large non-zero average value? and “large” compared to what? “Large non-average values are only possible for bosonic fields” -> why only bosonic fields can do this? Thank you Matt. , you are a Great Professor indeed . I notice in the above graph that the exotic vacuum has lower energy than our vacuum. How can the vacuum settle in a higher energy state? I would think it would tend to the low energy state. If my guess is correct our vacuum would be unstable (but long lived) and could tunnel into the exotic one at any time. This is the first I’ve heard about a second value for the Higgs field though. I wonder if the current values for top quark and Higgs masses are good enough to give an approximation of the half-life for our vacuum? If it turns out to be really short, could that give us some limits on masses of particles we don’t yet know about? Systems where the equations of motion or the Lagrangian obey certain symmetries, but the lowest energy solutions do not exhibit that symmetry. Eventhough there is no “flavor changes” in Hadrons, due to “color confinement”, the radioactive decay in weak interaction, indeed bring the “rest mass” to lowest energy level – despite it takes very very long time ? 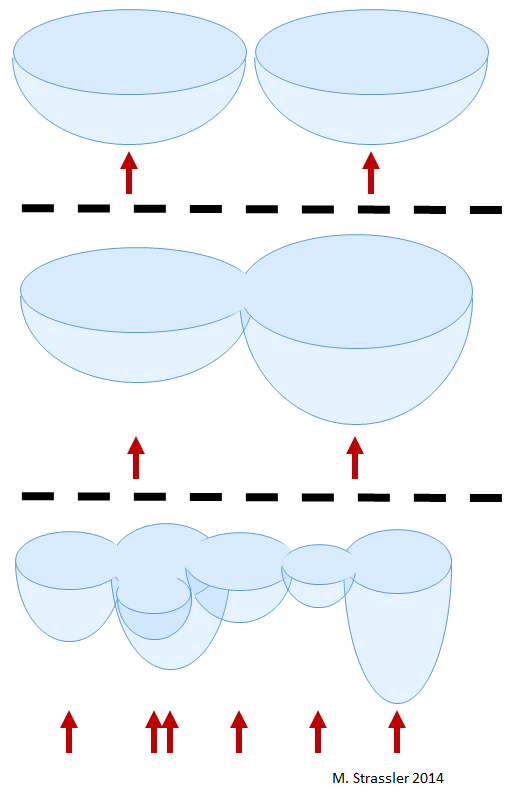 If you have a bowl with a complicated shape, as in Figure 3, there is no guarantee that a marble dropped into the bowl will end up in the lowest part of the bowl. It may end up anywhere marked with a red arrow. The spontaneous symmetry breaking is a geometric concept rather than a thermal one. ‘There is no reason why an invariance of the Hamiltonian of a quantum-mechanical system should also be an invariance of the ground state of the system” – Coleman (1975). ‘spontaneous symmetry breaking’ is misleading; the right term should be ‘hidden symmetries,’ which refers to systems in which some symmetries of the law are not visible — hence, hidden — from the lowest energy solution(s) of the law equations. Conservation law (which decides the rest mass) brings the marble to lowest part of the bowl. But the rest mass depends on “constancy” of various momenta. We will be never sure, the constancy of momenta remain the same – so also the rest mass (decrease in energy is decrease in mass). Difference in kinetic energy is difference in temperature. The slow movement of marble remain, despite the instability at the starting point. So the conservation law, to save itself, spontaneously break the geometric symmetry of the bowl ? – means, the marble may end up anywhere marked with a red arrow. ? A system only settles into its lowest energy state if given enough time and the right conditions. Sometimes it can be ‘easier’ for a system to get ‘trapped’ in a higher energy metastable state. This happens for example when liquid rock is cooled quickly and forms glass. Yes I understand but my dim understanding was that our space took on its current properties when the exotic vacuum decayed to a lower energy. Quantum fluctuations allowed the vacuum to breach the energy barrier and decay to a lower level. But if the exotic vacuum is at a lower energy then that can’t be right. No, that is correct. tunneling isn’t much different from any other method of decay. Imagine a vacuum with three different states, 1, 2 and 3 in order of decreasing energy with 2 being our current universe. Initially the universe is very high energy and any given volume of space can be in any of the three states as well as those states plus energy. You can think of this as a marble in a triple bowl being shaken enough to jump between all three bowls. As the universe cools it becomes harder and harder for any given volume to be leave the first state. (Which is the highest energy ‘stable’ point.) At some point the energy drops below this threshold and the universe settles into a metastable exotic vacuum. What happens next depends on the exact shape of the energy curve and the time before decay happens. ‘Ideally’ it will decay directly to the lowest energy vacuum via tunneling. But this is not the only option. If it decays ‘too soon’ then there can be enough energy for the vacuum to move between states 2 and 3 before again getting stuck in a metastable state 2 just as it did with state 1. As such it’s quite possible that a universe of many metastable vacua would transition ‘stepwise’ from lest to most stable instead o making the most ‘obvious’ transition. Assuming that the theory is correct for sake of argument, do these vacua exist out there in the universe and do they possible cover large volumes of it. If a proton wanders into one, does it cease to be a vacua and is the proton any different in the normal vacuum and the exotic one? Given that the Higgs field in the exotic one is many orders of magnitude larger than the normal one, would in any way account for the extra gravity that appears to be holding Galaxies together without resorting to dark matter? Interesting questions. I suspect the answer to your last one is simply no, though. For the question in the first line, my guess is that there could be other universes where the vacuum is in lower state. In condensed matter physics, crystals etc. it frequently happens that there are physical systems which correspond to different solutions of the equations. Let us see what Matt says about this. It is possible a volume of our universe exists in this second vacuum state, I believe it would form a bubble converting our higher energy vacuum at light speed, so we wouldn’t be able to see it. Any normal matter that encountered it would disintegrate. Is there a simple layman’s explanation for why the exotic vacuum it’s more stable? No; it relies on a very detailed, very complex calculation, and no one has any intuition for the answer. And little changes in the theory can make it less stable. Is there any way to tell whether or not “our” universe is the result of such a spontaneous collapse from the other vacuum state? If it’s possible that the “exotic” vacuum is actually higher-energy than ours, then could we be living in a post-vacuum collapse universe? What would that look like? Are there any observations we have made or could make that would confirm whether or not this was the case? I just realized the exotic vacuum could have a different cosmological constant than ours. Is this the idea behind the Higgs as the inflaton? Interesting article Matt. I suppose, there is a general agreement that if the Top quark and Higgs masses are at the currently measured values, there are two and *only two* vacuua and other masses such as b-quark do not change this fact. Is there an easy(!) reference for this? In the case of the top quark and such, the masses of other particles *do* affect the equation but the equation has to do (in part) with the Higgs and its interaction with other particles. The top quark interacts much, much MUCH more strongly than even the bottom quark so measuring its mass gives you the most accurate data for that particular variable. There must exist some mechanism to fix the up / down values , I cannot imagine that it does not matter ? am I right ? A swing at rest and one being pushed both have an average position of ‘at the bottom’ however one will lose energy if left alone and one won’t. 245 and 247 are both unstable values. A Higgs field changing like that would quickly emit all the extra energy as Higgs particles and settle down to a value of 246 in the same way a swing left alone will slow down and stop moving. @ Kudzu : Then we must ask , why 246 ? There must exist a mechanism that dictate this value , indeed any average value of any field must be dictated by a mechanism …. Is that correct ? In additionn, are the up / down values of which the 246 is the average fixed or can assume any value then would these values affect the output of the Higgs field ? I quite agree with you here. I hope Matt can answer this question fully. I hope the answer will not go into a long abstractification which in the end turns out that we have no answer yet because we have not solved hierarchy problem or cannot calculate those fundamental constants/values from scratch. but again the partial answer that can deepen our understanding is fine as long as it makes/facilitates some progress and is not repetitive. I hope at least there is some kind of physical models presented instead of just abstract graphs/numerical relations. It is difficult to see how they are connected to (real/concrete) physical systems. Correct. However this starts to get to very basic questions that we do not have answers for yet. Basically there is an energy associated with all vevs of a field. Many types of field *have* to have a vev of 0 because of what kind of field they are. This happens with say, the electron or proton field. Being fermions and obeying the exclusion principle they are forbidden to have nonzero vevs. Some fields will tend to whizz off to infinity and many more whizz off to zero, these generally have simple mechanisms behind them. But in cases like the bosonic fields (Higgs, gluon, etc) we’re not entirely sure why they have the values they do. We know they have a specific energy-vev plot, and we know it depends on some constants, (Specifically the equation we want is d2H/dt2 – c2 d2H/dx2 = a2 H – b2 H3) but as to why specifically the constants are what they are (and we’re still working out what they are.) I don’t think we have an explanation. So for now our answer for ‘Why 246 Gev’ is ‘Because’. Hopefully this will change in future. N.B. : @ Kudzu ….. But remember . Why 1atm.? Because ..then the reason , but why 246 ? There is no reason as per now . Sound field have many things special about it , like mass of earth , how much air do it have , density of air ….etc . So we know why our 1atm is not the same as venus 1atm . Values , but for 246 as an average between 246 + X , and 246 – X we really have no reason to tell as you said , but there must exist a mechanism to fix that indeed . Is a “field” simply the collection of measurements of a particular parameter in a given space, at a given time? Or is a “field” a more tangible “thing”. In your analogy to air temperature, the air temperature “field” is a collection of data points measuring air temperature at various locations, but its not anything “real” or “tangible”. Isn’t a “field” just a mathematical / theoretical construct? Put your finger in between two nice, hefty rare-earth magnets. Is the field pulling the two magnets together, and crushing your fingertip, a “tangible thing”? Or just a mathematical construct? What is the probability of tunneling from our vacuum to the exotic vacuum? Is it theoretically possible to “turn off” or isolate a single or all fields in a vacuum? I remember reading about the Higgs field in one of your great articles and that it would require an insane amount of energy to change its value. But would it actually be possible or would it violate fundamental principles. It is possible to change the value of the Higgs field in a volume of space to 0 on average, but this requires an insane amount of energy. You cannot remove a field from any volume of empty space though, they exist all throughout the universe. Is it possible that the exotic vacuum state of the Higgs field is the so cslled inflaton field that caused cosmological inflation to happen ? Based on what I have read about inflation the energy scale seems very similar to that of the second Higgs vacuum. But I dont know anything about the detailed physics. Professor, can you explain Spontaneous symmetry breaking in strong gauge invariance (marble) into “exotic vacuum”, during “Asymptotic freedom” at higher energies ? “[…] there’s no meaning to a temperature field in empty space”. Yes, I understand what you mean by speaking so. But… In a sense, though naively, couldn’t Cosmic Microwave Background Radiation be considered a kind of temperature field? Beyond its electromagnetic quantum field nature, obviously. He specifically mentions *air* temperature though; this ceases to have meaning where there is no air. Oh, yes, thank you: I didn’t notice. But I rather thought of CMBR anisotropy (George Smoot’s “wrinkles in time”, plus all other nowadays detection improvement). Field makes sense because of its gradient (wind from pressure’s gradient), so I wonder what kind of consequences from CMBR anisotropy ( = sky “temperature” gradient). Even if you remove the particles, there will be a thermal radiation coming from the borders. If you put a thermometer into the middle of a bottle containing no air, you would measure a temperature because the heat passes through the vacuum the same way light does. You would get a temperature yes, but it would not be the *air* temperature; on Earth the air temperature and ‘space temperature’ can be vastly, vastly different. In Antarctica for example they can differ by 200 degrees Celsius or more. Why does Fig 4 show the energy of the exotic vacuum below the horizontal axis(=0 energy?)? Does the SM predict the energy of the exotic one “negative”? Explain the phenomenon, answer the questions of the visitors, or ask your own questions otherwise stop posting your useless words and stop wasting the time of other readers. Given our current measurements of the Higgs and top quark masses the equations of the SM predict that the energy of the exotic vacuum is indeed less than our current one. (It is not negative, the value of zero on that graph is arbitrary, not the real energy.) This means it should be possible for our universe to ‘decay’ into a lower energy one. But it is very borderline and entirely possible that the exotic vacuum is a little higher energy. This would explain why we’re all still alive and existing. Also to answer your question as to why fermionic fields cannot have large values, they obey the uncertainty principle. If you like you can think that a large value fermion field would exclude itself everywhere meaning it has to be very high energy to get that large. So a zero or very small value is highly preferred. Modern physics, modern name for Lorentzian ether: virtual particles (SR violation) in a SM vacua ? in QFT spectral energy density is a Lorentz invariant random field. But there is no general proof of Lorentz invariance of zero temperature vacuum and although zero-point radiation is Lorentz-invariant in an inertial frame, thermal radiation at T > 0 is associated with a unique coordinate frame. Matt: I struggled with this. I take a special interest in relativity and Einstein, who referred to a field as “a state of space”. But this essay refers to multiple fields all in the same place. You even say “the electric field is an elementary field of nature” when the electric field is but “one aspect of the greater whole” which is the electromagnetic field. And then there’s electroweak which unifies further. But the Standard Model refers to the photon field which relates to the classical electromagnetic field, and to the electron field as something different. And to the Higgs field as something different too. Not to mention gluonic fields. I find that confusing, like it’s been leading us away from unification. However I don’t have a problem with different vacua, in that I can imagine different “phases” to space. One is the space we know and love, the other is the “frozen space” of the original “frozen-star” black hole, and the early universe. I like your blog. Great job. I also happened to read a weird comment from a freak that was barely understandable. I thought it was funny. Don’t get upset. It was Doc something. Apparently a well known freak. sorry I comment here, but I couldn’t connect to your FB page. I wanted to ask about entanglement. I’m very interested but all article’s and books I’ve read focus on 2 or 3 particles and are very vague beyond. What happens in real world, with millions of particles? What happens with entanglement? could you recommend readings for non professionals? Entanglement is a terribly, terribly delicate thing. Any disturbance or measurement will disrupt all the entangled particles. We have managed to keep entire multi-atom molecules in quantum superpositions and used the same phenomena to make quantum computers with a handful of qbits. But entanglement is far harder to deal with. In he main 2 or 3 particles are all we can do, all there really is. There is entanglement in nature, but it is fleeting, far shorter than the blink of an eye and I do not think it ever exceed 3 particles in magnitude. Is it valid to say that the fundamental field(s) can never have an obsolute zero value, but it (they) can all tend to and eventually obtain a zero average value(s)? Is this “configurations of the fields”, which define a vacuum, fundamentally describing a geometry of “space” itself? Speculation: I once asked if Energy ~ function of space (geometry) , i.e. symmetry (conservation) requires that space must tend to it’s most simplest geometry, which I believe would be a sphere. And any distortions caused by some unknown source could create the “quantum fluctuations” which in turn create the fields. 1.) In order to be stable (or metastable) a field needs to have an average value that is not changing. This CAN be zero bu for the Higgs field is not. (If the exotic vacuum is more stable the Higgs field is more stable with a value that’s less towards zero than it is now. Much less.) That average value must also not be due to an outside energy source. (The average value of current in an AC wire is 0 but the fluctuations are energetic.) This limits it to quantum jiggles. 2.) If ‘geometry’ includes dimensionality then no; fields can be any number of dimensions and why they are 3D in space I don’t think anyone knows. If ‘geometry’ is just the curvature of spacetime then that is described by the gravitational field. 3.) It is possible to have fields without quantum fluctuations, only ‘quantum fields’ have them as part of their very nature, they arise ‘naturally’ from the wave nature of things and as such it’s possible to make volumes of space that lack various fluctuations. (This is akin to measuring say the position of a particle very exactly.) As far as I can tell I think your speculation states that if energy is related to geometry then any given geometry would lose energy and end up as the lowest energy geometry. But in nature we often see symmetry at high energies and broken symmetry at low energies. Symmetrical gases freeze into less symmetrical crystals, massless particles gain different masses, the pencil balanced on its point falls over in one direction. Your theory might well lead to the lest symmetrical geometry and interestingly there are theories that state the universe as a whole has the geometry of a soccer ball or icosahedron or suchlike. This is precisely what I am referring to by saying space “collapses” down (volume wise) to a sphere, i.e. maximum curvature, smallest radius. So, Energy ~ F(space) merely means highest energies are inherent to spaces of smaller radii, tight curvatures. So, Dr E said gravity bends space so the higher the mass (energy concentration) of a galaxy the more it curves space. Now, reverse that thought and think of it as it is the geometry of space that defines the energy values. Maybe, “sphere” was the wrong (or at least a subset of the total picture) word to use, i.e. we can only perceive 3D because we ourselves are 3D configurations of space. A universe could have other solutions than a 6-quark atoms (confined and stable spaces) we just so happens we live in a 6-quark world. My persistence to this thought, simplifying it down to one variable (space) is because nature always tends to simplification of any system (configurations of space), so a space without pronounce fluctuations would be the goal. I might add, this thinking would also prescribe a cyclic universe(s) since we do exist and got here from that “perfectly symmetrical space, somehow, and will return back, somehow. So, no beginning and no end, just an ever changing “now”. So what about entropy? Well maybe entropy exist for our world, the 6-quark world, and when this one is over another solution will arise. “The question is therefore, at least indirectly, tied to the issue of how many types of fields does our universe really have?” This statement triggered the following question in my head, I fear it may be a bit silly but I hope you can let me have a brief comment. Is space granular? If so are the ‘grains’ made of anything. Is it nonsensical to think of space as a ‘field’ (zero or non-zero) just like any other field? Without any exact understanding of what a field is (or is made of) it seems people resort to a blanket word and description of ‘energy’ i.e. that all fields are manifestations of different forms of ‘energy’. Could space be just another form of ‘energy’. If it were would it be mutually exclusive to other fields i.e. would space be displaced by the creation of say an electron particle, after all two particles cannot occupy the same space. So I guess what I’m asking is whether particles created from their ‘fields’ actually exist in space or do they displace space in order to exist? OK that’s the dumb question/s, any comment would be gratefully received. This is not a good way to think about what a field is. Energy is something that fields *have*; it is by no means what fields *are*. [Just because you have height and weight doesn’t mean you are made from height and weight.] Fields have all sorts of properties that energy does not have. Fields are what is; they aren’t known to be made of anything else, or to be manifestations of anything else. Actually two particles (which are themselves ripples in fields) *can* in many cases occupy the same space. It depends on what types of particles you’re talking about. Two photons can certainly occupy the same space; that’s what happens in lasers. I find it fascinating that then that space may be a property of the gravitational field and indeed that the concept of the granularity of space is not yet ruled in or out. There seems to be a certain pleasant symmetry that fields can produce particles and that the gravitational field my produce grains of space. Hopefully I haven’t misinterpreted your comments and that this is indeed ruled out. If I wish to learn more about any possible research in this area are you able please to provide a few pointers as to which researchers to follow. Clearly I am handicapped by only having a layman’s ability and modest math but I find the pursuit just as rewarding as the understanding 🙂 Thanks. Since there can be many fields (and associated particles) in space, it’s probably more helpful to think of space as the fundamental thing. Space seems to be granular at the Planck scale. By definition and experiment, you can’t cut it any finer. What is the definition of “space”? You write vacua are different “configurations of fields”. So if you remove all particles from the universe will you be left with just fields or will the fields diminish are the particles diminish? Certainly there cannot be particle without fields but can there be fields without particles? My senses tell me we live in 3D space because we, ourselves, are composed of 3D particles (6-quarks atoms). Could we be sharing space with other dimensional entities? For example, dark matter could be atoms of a different atom configuration, i.e. more than 6-quarks which would require a different physics to formulate it. A fair question on vacua and vacuum fluctuations arises at event time zero of the big bang theory. A vacuum fluctuation is said to have been the seed from which our universe was born. A definition of vacuum as we know it and as discussed above is a region in space-time with fields for all of the elementary particles, most with value zero apparently except for the Higgs field and assuming that the field is a confined space, the temperature of the “walls” is absolute zero so that black body radiation (photon) does not emanate within the space. At event time zero, there was no space-time, no fields of any kind whatsoever, and therefore no vacuum as we know it. This is likely a philosophical question: how can a vacuum fluctuation have occurred in the absence of vacuum as we know it? I think perhaps the correct terminology might be a void fluctuation since vacuum has a definition that is inconsistent with event time zero. Void would need to be defined as a point surrounded by no fields whatsoever.